"An enchanting desert wilderness, surrounded by dramatic sandstone mountains and cliffs, that will strip your soul back to basics and have you gazing up at the stars in wonder and amazement…"
The impressive exquisiteness of Wadi Rum has long captivated the mind of its visitors. Otherwise known as ‘The Valley of the Moon’, it is a protected desert wilderness since 1998, spreading over 720km2 and comprises of huge sandstone, granite mountains, valleys and canyons. Wadi Rum is the ideal 1- or 2-night stop, following a stay or trip from Petra or the Red Sea resort Aqaba. Wadi Rum offers its guests an authentic flavour of Bedouin culture whilst surrounded by the vastness of the desert and an unforgettable experience marvelling at nature’s spectacular beauty. The area has long been synonymous with T. E. Lawrence and kick-started Jordan’s tourism following the success of David Lean’s 1962 masterpiece, Lawrence of Arabia, filmed on location in Wadi Rum. In recent years, other Hollywood Blockbusters have been filmed there, such as The Martian (2015), starring Matt Damon, directed by Ridley Scott and Transformers: Revenge of the Fallen (2009). 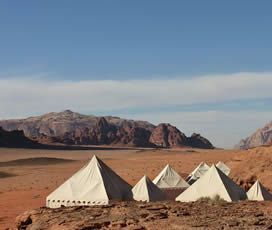 Staying in Wadi Rum can be both relaxing and adventurous. 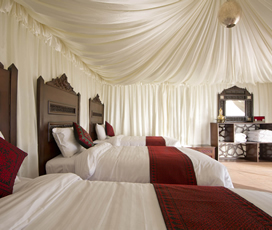 If relaxation and stripping back to basics is what you are looking for then you can look forward to sunset yoga sessions, tasting delicious Bedouin gastronomy carefully prepared by your camp’s private chef, learning about Bedouin culture and enjoying traditional Arabic entertainment from music to storytelling. During the day you can ignite your inner adventurer and explore the desert’s impressive landscape through hikes, climbing, trekking, camel rides, jeep tours and exploring the spectacular cave and rock carvings. An experience you will never forget is looking up at the night sky, sprinkled by the infinite stars that dress the night. The stunning desert of Wadi Rum is located in Southern Jordan 60km (37 miles) to the East of Aqaba and about 4 hours from Amman. In the winter months, you can fly direct from Heathrow to Aqaba, whereas in the summer you need to fly via Amman. It is a place highly recommended as a stop and stay when on a city break in Amman or a beach holiday in Aqaba. A Year-Round destination, Wadi Rum, can be visited at any time of the year, however between March-May and September-November the climate is at its most temperate, allowing you to explore the desert at ease. In the spring the weather is also welcoming, as desert plants come alive and decorate the valley. 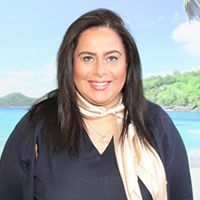 If you are feeling brave enough, you can expect lesser crowds in the summer and winter months, but this is when the weather is more temperamental with very hot temperatures (summer) and it is windier and colder (winter). The beautiful desert landscape has an illustrious past and rich heritage, which can only be felt and discovered in person. Exploring the desert, you can expect to come across petroglyphs, inscriptions and ruins, all fragments of prehistorical Nabaetean culture. In more recent times, Wadi Rum was introduced to the Western world by T.E.Lawrence, known to the world as “Lawrence of Arabia”, a British officer turned author who was based in the area in 1917 during the Great Arab Revolt. Wadi Rum is home to the Zalabia Bedouins, who have collaborated strongly with avid climbers and trekkers, and development the area’s tourism as its main source of income. All its current residents are Bedouins who in ancient times were nomads, herding their animals around the desert. Most Bedouins can now be found in Rum Village, which is the area’s only settlement, though you can still find Bedouins who are living the traditional nomadic lifestyle. Its strong heritage and traditions are inescapable and are a prominent feature that tourists seek to experience when they visit, as it offers them an authentic taste of Bedouin life and culture. 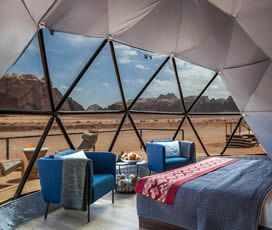 A stay for a night or two in Wadi Rum is an experience that the whole family can treasure and can form part of a great and diverse type of family holiday. Some of the activities the family can all enjoy together include: camel rides; hiking; trekking; jeep tours and dune drives; a buggies drive; nature walks and taking a hot air balloon ride over the spectacular Wadi Rum. Wadi Rum has ample opportunities to experience and see up close majestic attractions. Explore the Lawrence Spring, named for T.E.Lawrence; the Khazali Canyon, known for its incredible ancient petroglyphs and carving on its rock walls; the Anfishiyyeh inscriptions with its ancient drawings; the tallest natural rock bridge Burdah Rock Bridge and the Seven Pillars of Wisdom, a rock formation named after T.E. Lawrence’s book. For those seeking adventure there are hiking trailers, mountain climbing opportunities and seeing the amazing landscape by 4x4 or in a hot air balloon. Staying in Wadi Rum is all about stripping the soul back to basics. At the camps that we feature guests can expect to enjoy authentic meals, with locally sourced ingredients freshly prepared by camp chefs; dine under the starlit sky surrounded by the grand sandstone mountains; traditional Arabic music and even Wi-Fi (subject to the camp).